John R Kirk, eldest son of George W & Mary Jane (Reid) Kirk, was born January 23, 1851 in Bureau County, IL, but was raised on a farm near Eagleville, Harrison County, MO. John received his primary education at a local rural school, then attended Bethany High School where he graduated in 1870. The next fall, he began his long teaching career at his old school in Eagleville. In 1873, Kirk enrolled at the First District Normal School in Kirksville and attended irregularly, alternating his own education with teaching in rural schools. During his terms as a student, he also worked as secretary to President Baldwin to pay for his education and to support himself and his young family. He completed the Bachelor of Arts & Didactics and graduated as valedictorian of his class in 1878. For the next sixteen years, Kirk served as superintendent of schools at Moulton, IA and Bethany, MO, and as principal and teacher in the Kansas City and Westport, MO schools. In 1880, he received the Master of Arts & Didactics, a degree awarded to Normal graduates who completed two years teaching experience plus a specified reading program. He also read law and was admitted to the Iowa Bar in 1884 and the Missouri Bar in 1885. He actively practiced that profession for less than a year, including the few months he spent as Bethany City Attorney while he was the Superintendent of Schools. Kirk was elected State Superintendent of Schools in 1894 and served two terms, 1895-1998, but lost his bid for reelection for a third. He left office January 1, 1899 and was immediately appointed Inspector of High Schools for the University of Missouri. Six months later he was offered the Presidency of The First District Normal School, his alma mater at Kirksville. He accepted and took office that July. John Robert Kirk and Rebecca Idella Burns, a teacher from Fort Dodge, IA, married July 15, 1875, while he was a Normal student. By the time he returned to Kirksville as President, they were the parents of six, Robert, Elsie Lucretia, Todd, Victor, and 5-year old twins Mary Elizabeth and Laura Pauline. All six children graduated from the Normal and pursued teaching careers. Over the next twenty-six years, Kirk expanded the programs of the Normal School and led the movement to change its status from Normal to full-fledged Teachers College. He also became one of the country’s leaders in teacher education and an innovator and expert in rural education and the training of teachers for rural schools. He was an active member and officer of numerous professional organizations including the Missouri Teachers Association, National Educational Association, Commission on Accredited Schools and Colleges of the North Central Association, and the American Association of Teachers Colleges. His many honors over the years included honorary LLDs from two Missouri colleges. 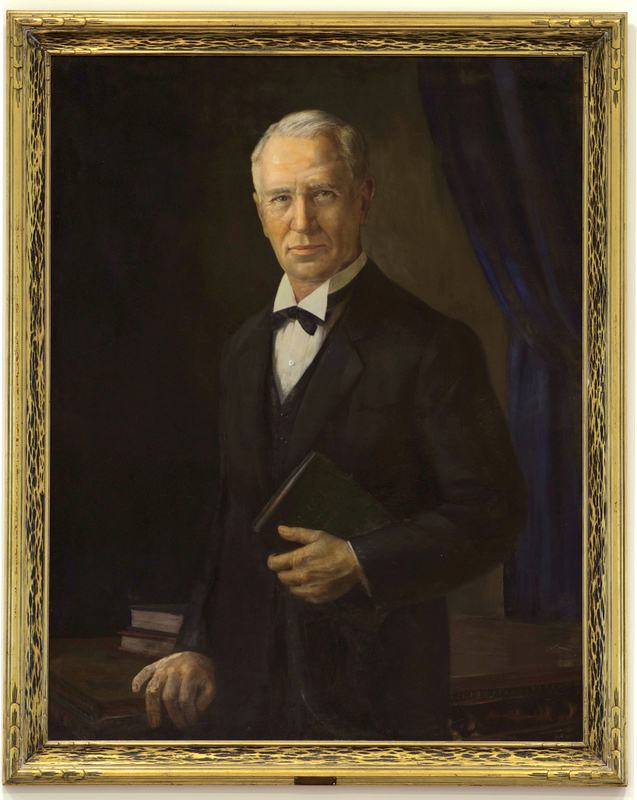 After retiring from the Presidency in 1925, Kirk returned to the classroom for two more earned degrees. He received a Bachelor of Science in Education from Northeast in 1926 and the following fall, enrolled as a graduate student at George Peabody College for Teachers in Nashville. He was awarded his Masters of Education in 1930, at age 79. John died at home in Kirksville November 7, 1937 and was buried at Maple Hills Cemetery in Kirksville. The Kirk Memorial Building, funded primarily by donations collected in a joint campus, alumni and community effort, was built in his honor and completed in 1940. It stands at the south end of the main Quadrangle, next door to Kirk Auditorium (now Kirk Building). Other campus memorials to him include Kirk Academy, Kirk Society and his portrait in the Presidents Gallery.